So anyone have any information regarding there being foil cards in the booster packs? iv always been a fan of collecting more then playing so having some rare cards to find would be great. YES! I remember seeing something with a designated rarity of "SR", but I couldn't find it again. There's also signed cards, on the official site. Speaking of that page I linked. . .anyone want to take a gander to see if we got the rules down correctly? ohh signed cards very nice they can sell for a pretty penny, still kinda hope they have the classic holo cards in there tho. I'm guessing the 65 is just so you have some extras in case of breaking. That's pretty common for designed sleeves. For comparison, the Vanguard official sleeves have 53, and they have a 50-card deck. I might remember wrong, but I thought there were a few holo cards at the press event. No it wasn't during the broadcast, it was afterwards when members of the Japanese media got to play the game. You know what I just noticed? After looking on the official site, I saw the MSRPs and, I gotta say, this game looks to be absurdly cheap. Starter Decks look to be about $10 and packs (at ten cards each, rather than the usual five) are $3. This might actually be the cheapest card game I have ever seen. I'm guessing that fact has something to do with its popularity right now. And of course I hope the popularity will drive Nintendo to bring it over here. It's unfortunately just really general rules from what I can understand (Basically what was on the stream); it's quite a bit less than the various reports we got afterward. I have to admit I am looking forward to the official ruleset, at least something more than what we got here. I really like the concept that the anniversary sleeves were going for but I wish the background wasn't white; it doesn't look dynamic enough. That being said until they come out with sleeves of a Hector card or one of my other favorite characters I'll probably stick with those. On another note, I remember we got word that FE14 is changing up the way the weapon triangle works. 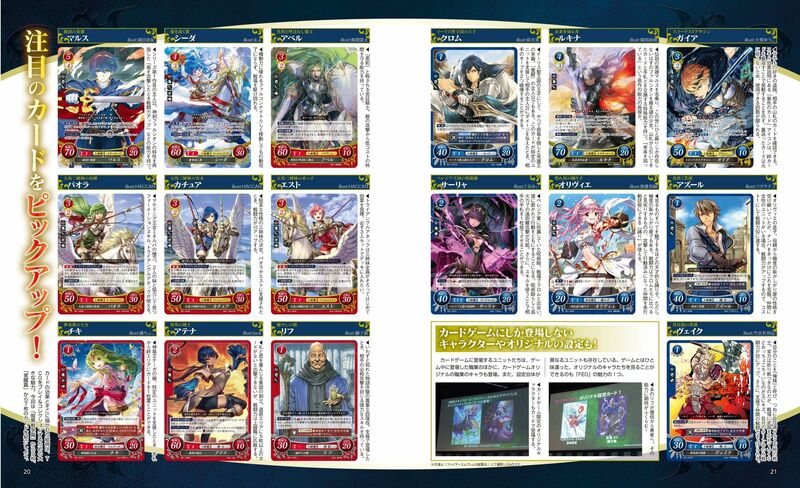 I wonder if Cipher will mirror those changes and that's why we haven't gotten a lot of official details on Cipher's rules. 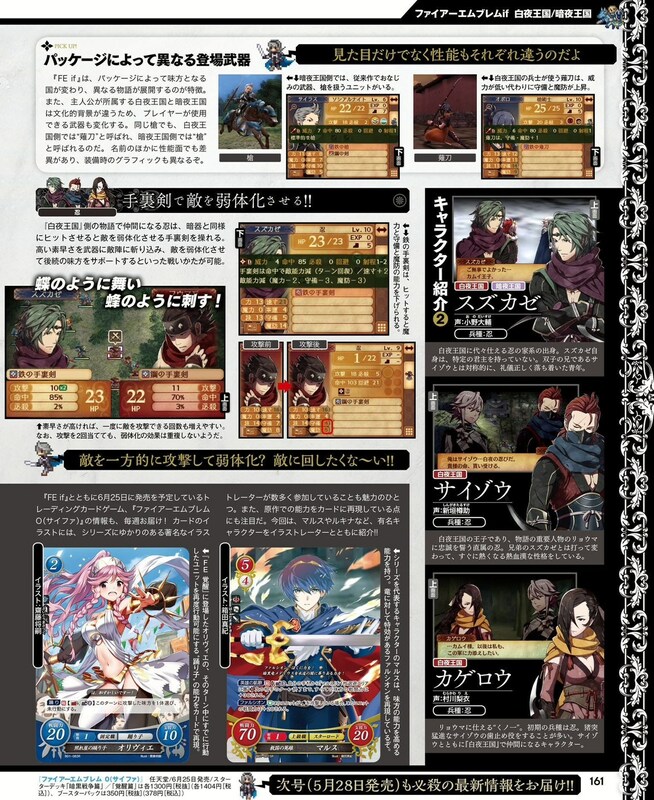 I could see them going either way, sticking with the old rules or mirroring all the new mechanics from FE14. We are getting decks from a range of the games. What do yall think? I just recently joined a facebook Fire Emblem Cipher group and spread the word that Serene's Forest is working on a wiki. One of the translators said he was interested in working together, so I thought I'd let you know. Perhaps for ease of access you can respond either on the Facebook, or respond here and I will let him know. 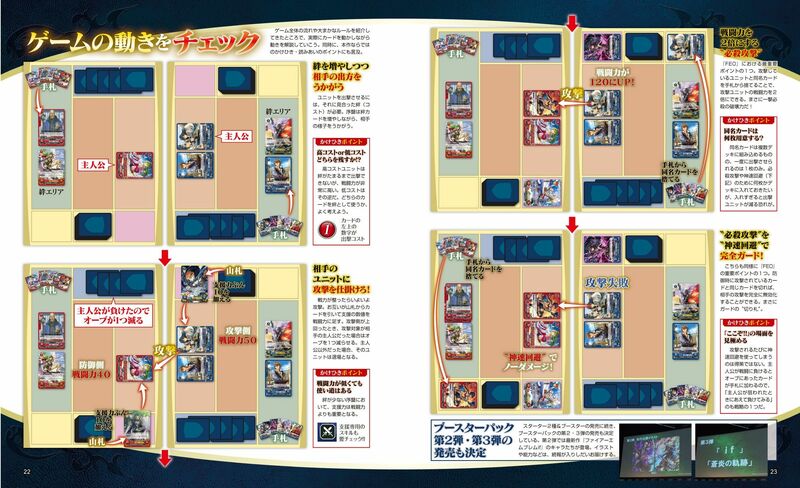 . . .or Famitsu can confirm the presence of holo cards. Here's the page in question. 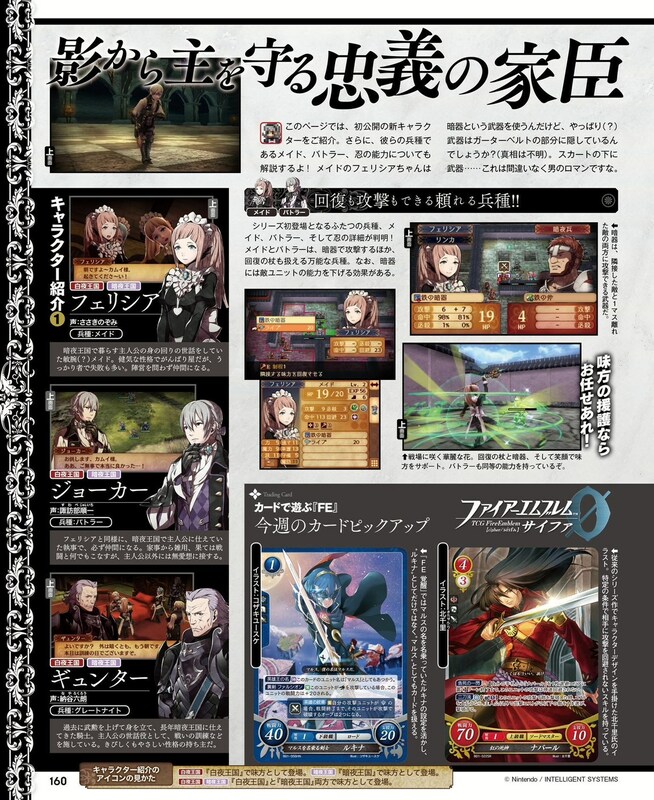 The holo card is Navarre, or "the sword dude in red". The rarities are listed on the lower left corner, ALL the way at the bottom. EDIT: Marth, the Lodestar. Can't tell what he does, except counterblast like crazy. According to the official site, there's 50 distinct cards in the booster packs, and 10 in the trial decks. Unless I read it wrong or something. I would imagine that there will be a lot of cards to collect. Every playable character from the FE11 & FE13, plus I would be very surprised if significant bosses like Medeus and Validar were ignored. If you're ordering from amiami, they have a page with their shipping rates! One deck is roughly 75g, and one booster box with 12 packs of cards is usually around 300g. It's actually one of the cards aubergine translated. It's basically "Win the game and slap your opponent" combined. +30 to ALL your units for one entire turn (includes the enemy turn too). There's also the "Original Concept" variants and the fact that most units will have at least 2 normal cards each for their unpromoted and promoted classes. I think some characters even have multiple promoted class cards for the secondary class in their tree, like Caeda who has both Wyvern Knight and Falconight cards. I think there will be lots of cards to collect in the first series alone! Oh man, thanks for sharing these! This will be a major help in putting my tentative cards and my more uncertain translations to rest. 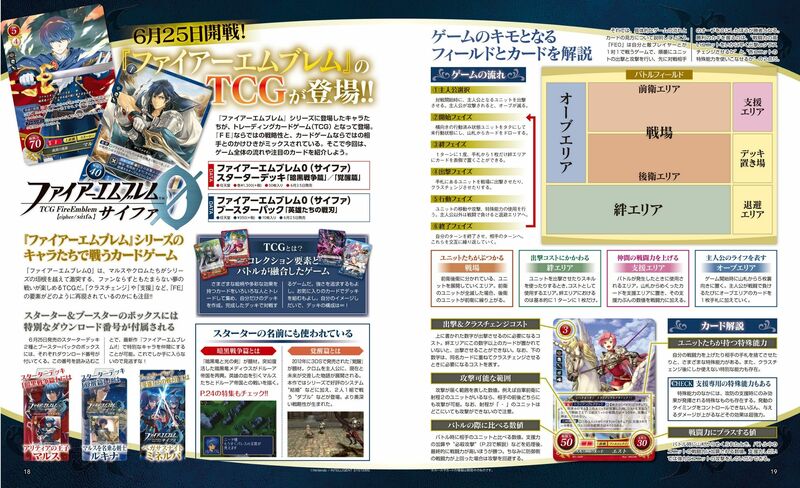 Hmm... At the bottom left of page 22, we can see Chrom attacking diagonally. I kind of assumed you could only attack the enemy facing you directly, but that's obviously incorrect. I wonder if you can only attack diagonal if there's no enemy in front of your card, or if you can all the time..? I'm going to assume you meant 50 in the trial decks and 10 in the booster packs here. @Kirie: Thank you for the info on card sizes! I've already placed a preorder for a bunch of them.